Steven Terner Mnuchin (born December 21, 1962) is an American banker, movie producer and political fundraiser. 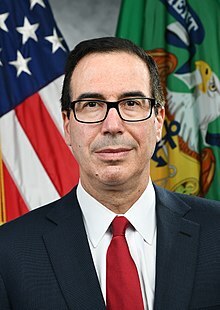 He is the 77th and current United States Secretary of the Treasury, under the Trump Administration since February 13, 2017. Mnuchin was born to a Jewish family, circa 1963. He is the son of Elaine Terner Cooper and Robert E. Mnuchin. He earned his Bachelor of Arts degree at Yale University. Mnuchin had a fortune estimated at over $40 million while working for Goldman Sachs. In 2002, Mnuchin left Goldman and worked briefly for his Yale roommate Edward Lampert, chief executive of Sears. He also briefly worked for Soros Fund Management. In Hollywood, Mnuchin, along with movie producer Brett Ratner and financier James Packer, working with RatPac-Dune Entertainment, produced American Sniper and Mad Max: Fury Road. Mnuchin supported Mitt Romney during the 2012 U.S. presidential election. In May 2016, he was named finance chair of the Donald Trump 2016 presidential campaign. After Trump won the presidency, he is seen as Trump's top pick for United States Secretary of the Treasury. On February 13, 2017, Mnuchin was confirmed by a 53–47 vote in the U.S. Senate. He was sworn-in by Vice President Mike Pence the same day. As Secretary of the Treasury, Mnuchin has been a supporter of proposed tax reform, and for reducing corporate tax rates. Mnuchin supports a partial repeal of Dodd-Frank. Mnuchin's use of government aircraft for personal usage has come under fire from watchdog groups. In 1999, he married Heather deForest Crosby, who was his second wife, and they had three children together. They divorced in 2014. He married actress Louise Linton in 2017. They lived in Los Angeles, California and currently lives in Washington, D.C..
↑ 1.0 1.1 1.2 "WEDDINGS; Heather Crosby, Steven Mnuchin". The New York Times. September 26, 1999. Retrieved May 10, 2016. ↑ Sorkin, Andrew Ross (May 10, 2016). "Unlikely Fund-Raiser for Trump and Party (hardcopy)". The New York Times. Retrieved May 10, 2016. ↑ "Former US banker Steve Mnuchin confirms he will be US treasury secretary". BBC News. November 30, 2016. Retrieved November 30, 2016. ↑ Pramuk, Jacob (13 February 2017). "Watch Steven Mnuchin Senate confirmation vote". www.cnbc.com. ↑ "CNBC Transcript: Steven Mnuchin and Wilbur Ross Speak with CNBC's "Squawk Box" Today". CNBC. November 30, 2016. Archived from the original on March 28, 2017. Retrieved March 28, 2017. ↑ Sorkin, Andrew Ross (November 30, 2016). "Steven Mnuchin, Expected Treasury Pick, Is an Outsider to Public Policy". The New York Times. Archived from the original on December 8, 2016. Retrieved December 10, 2016. ↑ Harwell, Drew (August 31, 2017). "Treasury inspector general to review Mnuchin's flight to Fort Knox". The Washington Post. Archived from the original on September 15, 2017. Retrieved September 25, 2017. ↑ Price, Greg (September 11, 2017). "Mnuchin and Linton's solar eclipse trip got the Treasury sued". Newsweek. Archived from the original on September 26, 2017. Retrieved September 25, 2017. ↑ "Steven Mnuchin Businessweek Profile - Bloomberg Politics". Bloomberg.com. 2016-08-31. Retrieved 2016-11-12. ↑ 11.0 11.1 "Film financier and Wall Street executive Steven Mnuchin a leading candidate for Treasury secretary". Los Angeles Times. 2015-02-02. Retrieved 2016-11-12.